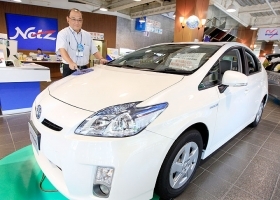 Kenichi Ishida, chief of a Toyota Netz dealership, polishes a Toyota Prius hybrid car in his dealership in Tokyo in September 2009. Ishida saw monthly sales at his Toyota dealership surge by up to 50 percent under the Japanese government's stimulus plans to boost car demand. Now he frets that famine will follow feast. (Bloomberg) -- The Prius hybrid has spearheaded sales growth for Toyota Motor Corp. in Japan for more than a year, helped by government subsidies. The model will likely bear the brunt of plunging demand as the support ends. The number of customers signing up to buy a Prius at Tokyo Toyopet's 66 showrooms has dropped to about eight a day from 20 in June, Inoue said. Industrywide, car sales in Japan are expected to plunge 23 percent in the six months beginning in October from a year earlier, according to the Japan Automobile Dealers Association. Demand for the Prius surged after the third-generation model went on sale in May 2009 and the government introduced the incentive plan a month later. Under the program, consumers can apply for a 250,000 yen ($2,963) subsidy if they scrap a car more than 13 years old to buy a more fuel- efficient one, or 100,000 yen for a new car bought without scrapping the older one. In the six months through June, Prius deliveries more than tripled to 170,426 and made up 20 percent of Toyota's total domestic sales. Prius orders are already slumping because a backlog means cars bought now won't be delivered in time to receive the handouts, Inoue said. Other Toyota models have quicker delivery periods and should still qualify, he said. “Toyota dealers will likely try to minimize the sales drop with their own incentives,” said Yoshiaki Kawano, a Tokyo-based analyst at consulting company IHS Automotive. The fallout when subsidy programs ended in Germany and the U.S. may signal what lies ahead for Japan's automakers. In Germany, incentives totaling 5 billion euros ($6.4 billion) for buyers of new vehicles who turned in old ones boosted sales 23 percent last year, according to the VDA auto industry association. Without further subsidies, new car registrations in the country slumped 29 percent in the first seven months of 2010, according to the association. The U.S. government offered $2.88 billion in rebates last year for the replacement of vehicles for buyers who traded in older cars and trucks for more fuel-efficient models, yielding almost 700,000 sales, of which Toyota accounted for more than 19 percent. Toyota's U.S. sales fell 3.2 percent to 169,224 vehicles, and Prius sales dropped 26 percent to 14,102, last month compared with a year earlier, when the model benefited from the nation's “cash for clunkers” program. Gasoline prices have also stabilized, pushing demand back to larger vehicles, said Jessica Caldwell, director of industry analysis for Edmunds.com in Santa Monica, Calif.
Toyota's sales drop in Japan may be partially offset by the introduction in December of an updated Vitz compact, Japan's third-most popular standard car for the first six months of the year, IHS Automotive's Kawano said. Japan sales of the Prius surged even as Toyota suffered a major recall crisis. Few orders were canceled after Toyota recalled 223,000 hybrid cars in Japan in February to fix brake systems, said Takeshi Fushimi, director of the auto dealers association. In place of the subsidy, Toyota dealers will likely offer their own discounts using cash saved from money allocated for recall-related repairs, said Koji Endo, an auto analyst at Advanced Research Japan in Tokyo. While Toyota gave dealers about 20,000 yen for each recalled Prius, the actual repair costs didn't reach half that amount, Endo said. Tokyo Toyopet, the city's largest Toyota dealer group, is providing discounts worth about 50,000 yen for options such as high-performance lights and roof antennas, he said. Demand from corporate clients, which make up almost 40 percent of Tokyo Toyopet's sales, may also help stem the drop, he said. Still, some customers have already managed to snag deals. Chieko Kameda, who ordered her Prius June 26, said her dealer in Mita, central Tokyo, gave her a discount of almost 100,000 yen if she agreed to place an order that day. Her dealer informed her that by the time her Prius is delivered in September, money for the subsidy program may have run out, Kameda said. Rivals also face a slump in demand when October comes. Honda Motor Co.'s Japan sales may drop 21 percent to 290,000 in the fiscal second half from 367,718 a year earlier, the Tokyo- based carmaker's Executive Vice President Koichi Kondo said last month. Nissan Motor Co.'s drop may be limited to 1 percent as the company plans to introduce a new Serena minivan in September and has already introduced a new March compact and Juke compact crossover, Kawano said. A new Elgrand minivan also hit showrooms this month. Nissan's Japan market share will rise to 14 percent in the fiscal second half from 13 percent a year earlier, while Toyota's share will fall to 27 percent from 33 percent, Kawano said. Minicar makers such as Suzuki Motor Corp. and Daihatsu Motor Co. will also gain since subsidies for their models were less than for standard cars, he said. Electric, hybrid, natural-gas and some diesel vehicles will still qualify for an exemption from the country's weight and purchase taxes, and other fuel-efficient models will be given tax breaks. “We'll remind customers of the reduced taxes,” Inoue said.